There used to be a time when I was not such a big fan of sweet potatoes. I think this has everything to do with that insipid sweet potato casserole topped with marshmallows. I am not cool with a big pile of gooey sweetness on my dinner plate and marshmallows should be relegated to desserts and campfires. I know I will offend people with that statement, pharm but I just do not like that holiday tradition. I do, health however, website like this really like sweet potato fries, especially with a little cajun seasoning or smoked paprika. Those are very welcome on my dinner plate, so I’ve been trying to give the sweet potato a chance. Since it’s summer and sweltering outside, I kept the oven off and grilled my potatoes instead of roasting them. The trick to grilling potatoes is to parboil them a little before they hit the grill. Otherwise, you get charred and raw potatoes. Not so tasty. By finishing the potatoes on the grill, they get nicely caramelized and lovely-looking grill lines. To balance some of the sweetness, I made a simple dressing of peanuts, lime juice and tahini. A little cilantro and crumbled cotija cheese are sprinkled on top for a smoky, sweet and salty side dish that’s just right with some chili-marinated chicken or steak. Who doesn’t love summer? Place the potatoes in a large skillet and add just enough water to cover them. Set over medium heat and allow the water to come to a slight simmer. Cook the potatoes for about 8 minutes, or until they are just fork-tender. Gently drain and set aside. You can do this up to a day in advance. While your potatoes are cooking, make the dressing by whisking together the lime juice and tahini. Stir in the peanuts and set aside. Preheat your grill to medium and brush the potatoes with olive oil on all side. Place the potatoes on the rack and grill for 3 – 4 minutes on each side, or until they develop grill lines and begin to caramelize on the outside. Remove to a plate. Drizzle the dressing evenly over the potatoes. Top with the crumbled cotija cheese and cilantro leaves. Serve immediately. looks awfully good. thanks for the suggestion to par-boil first. I’m still among the uncoverted when it comes to sweet potatoes – one of my very few dislikes. Problem is that my wife loves them. This recipe actually looks like there might be some room for compromise – tahini and sweet potatoes sounds pretty interesting. I have a jar of tahini and I’m still learning ways to use it up. Thanks for the recipe! 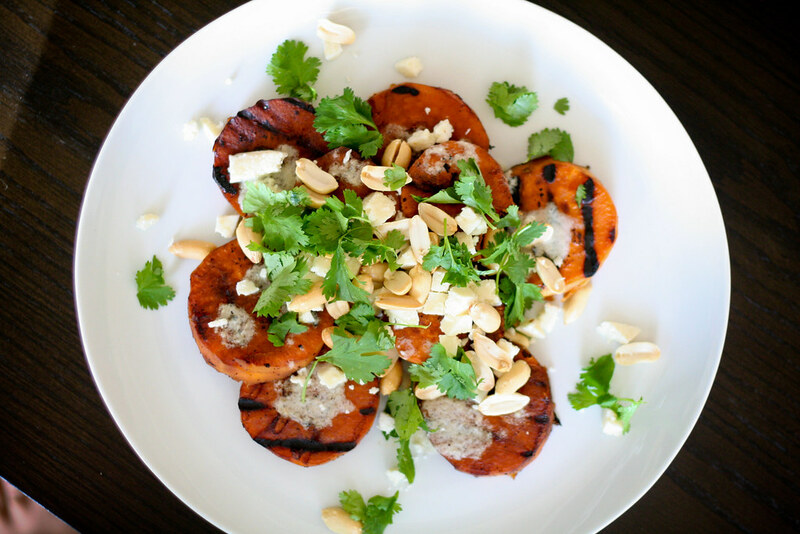 tahini is always so amazing to work with.ill have to try w sweet potatoes, one of my fav. If this tastes half as good as it looks – gorgeous presentation! I can actually taste the flavors melding in my mouth from your description. Will be making this – this week! I feel the same way about that casserole. I usually bake sweet potatoes with cajun seasoning or cayenne pepper. I’m looking for a way to grill them and am going to try it tonight. 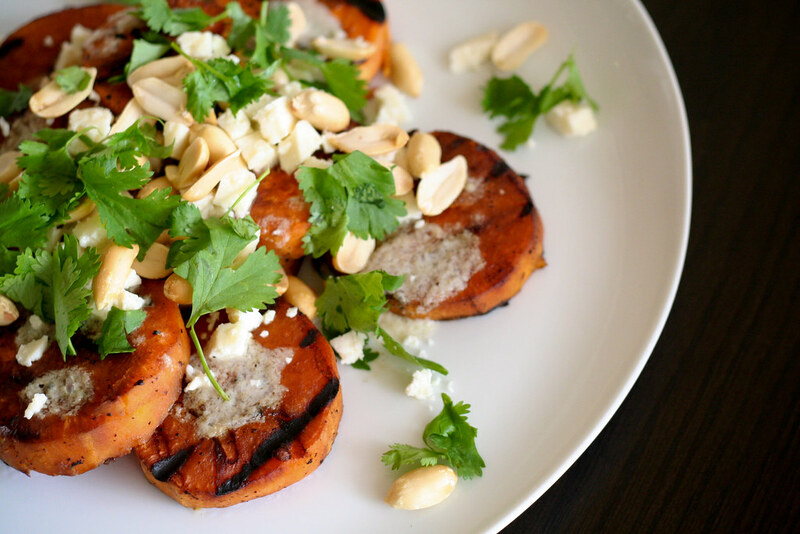 Your grilled sweet potatoes look great. I am a huge fan of anything sweet potato! Nice peanut lime sauce as well. Just made this for dinner and it was PHENOMENAL. I don’t normally like sweet potatoes that much, but this is definitely going into the regular rotation. Thanks Mel! I totally agree about the sweet potato casserole. I usually make baked sweet potato fries with olive oil and salt/pepper but this looks like a nice way to dress it up. Pingback: Design Crush » A Thanksgiving Feast.